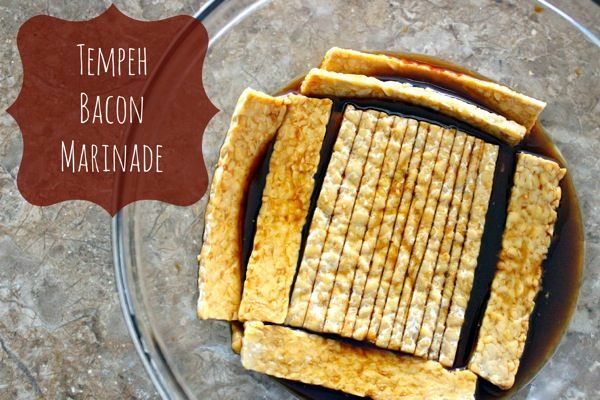 It's that time of year; time to win over the one you love with…tempeh bacon! Or, roses. But, if I were you, I'd stick with the tempeh. Marinated tempeh is a great alternative to having traditional bacon on a BLT (because you know you'll want to use this for a BLT), plus, it's much more animal-friendly and better for you! When I first tried tempeh bacon, I was blown away with how awesome a replacement it was. It's smokey and, honestly, such an easy swap to make for meat lovers. I avidly bought the tempeh that was already marinated and packaged to give it that 'bacony' flavour, until one day last week, I wondered why I wasn't just marinating my own at home? So began something new. You never know how easy something is until you try it…like buying roses the day before Valentine's Day, so they don't cost one-thousand dollars. Combine all ingredients (minus the tempeh) in a large bowl, whisk, then place cut tempeh strips into marinade and set aside for at least 30 minutes. When ready to cook: heat frying pan over medium-high heat, add oil and fry tempeh strips for 4-5 minutes per side (or longer if you want them extra crispy). And since you've marinated your own tempeh, why stop there? Help spruce up that BLT with a few extra toppings! Nothing says 'Be Mine' like smokey, bacon flavours titillating your taste buds. Too much? Or maybe I just really enjoy a good sandwich. Yup, that might be it. Everyone have a great day/night whether you celebrate Valentine's Day or not. The hubby and I are having a date night tonight, which conveniently is falling on Valentine's Day, but trust me, it's not solely for that reason. We just really need some quality time together over a nice dinner! Also, a very happy birthday to my niece, Ella, and my friend, Kara!! Valentines's Day: yay or nay for you?